Left to right and then down. All the pictures are clickable for a bigger view. 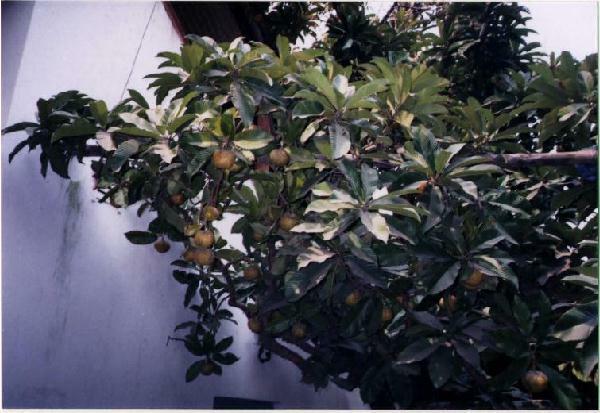 Picture 1 is the famous chalta/chalita tree we talked about earlier. 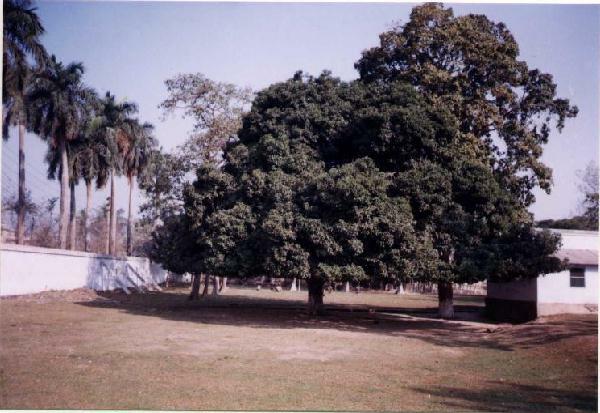 It is the picture of a single horizontal branch of the chalta tree hanging closest to the ground. The chalta tree is located on the northeast corner of the Gambhira temple adjoining the westward exit/entrance door to the Gambhira temple. The full chalta tree with a view of the peak of the temple can be seen in the panoramic picture tour of the Gambhira Temple screen in an earlier hyperlink. Picture 2 is the picture of the famous Bakul Tree, as can be viewed beside the cocoanut treeline in front of a taller tree on the back. This bakul tree has been standing there since Prabhu Jagadbandhusundar established Sri-Angan in 1899. This bakul tree must have witnessed a lot Prabhu's Lilas with his devotees, the specifics of which will be outlined at a later time. Picture 3 is the trunk containing the primary boughs of the chalta tree. 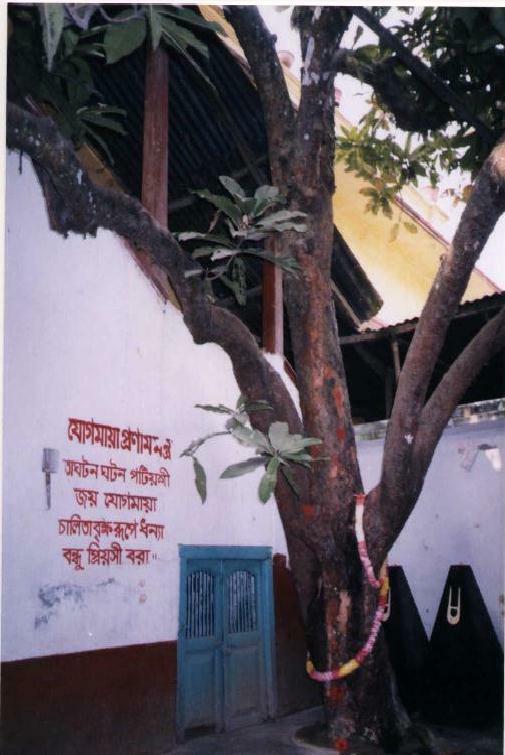 On the wall to the left is written a poem of four short lines in Bengali alphabets to indicate the significant relationship of Jagadbandhu with this chalta/chalita tree. Please click on the link below to read more about this tree. On the cemented base adjoining the this trunk, replicas of samadhis (graves) of the eight brahmacharis who were killed by the Pakistan military forces in 1971 during Bangladesh Independence War, are located. The two in black color are visible to the right near the foot of the chalta tree.